6,255 garlic cloves in the ground! Twenty-five years ago this week, I was admitted to Evanston General Hospital (IL) for surgery to treat my first breast cancer (diagnosed when I was only 34 years old in 1984) on the Wednesday before Thanksgiving. 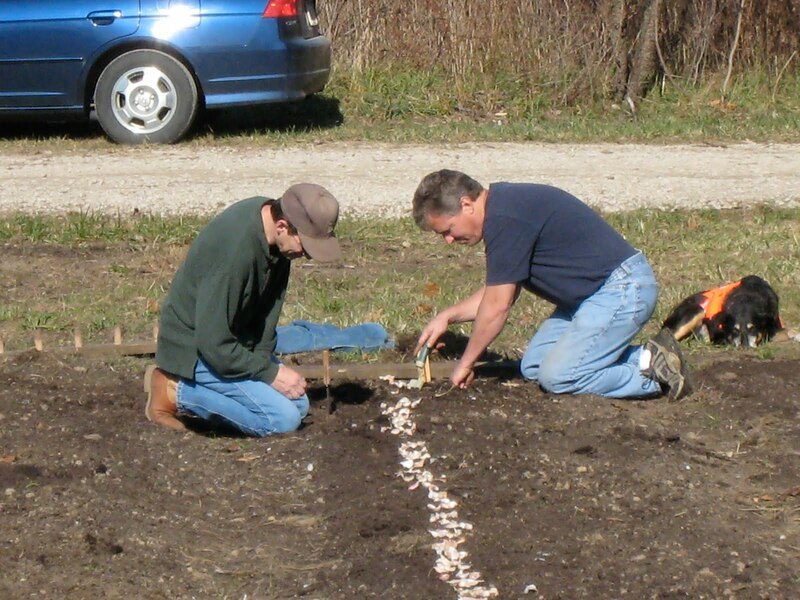 How thankful I am that I am "still here", celebrating these 25 years by finishing our garlic planting for the year. After planting nearly 2,500 garlic cloves by ourselves, working out the techniques, we put out a "last-minute" mass email to friends to come help us finish planting when we saw the beautiful weather forecast for the Saturday of last weekend (clear and in the 60's, a real rarity for a Michigan November day!). 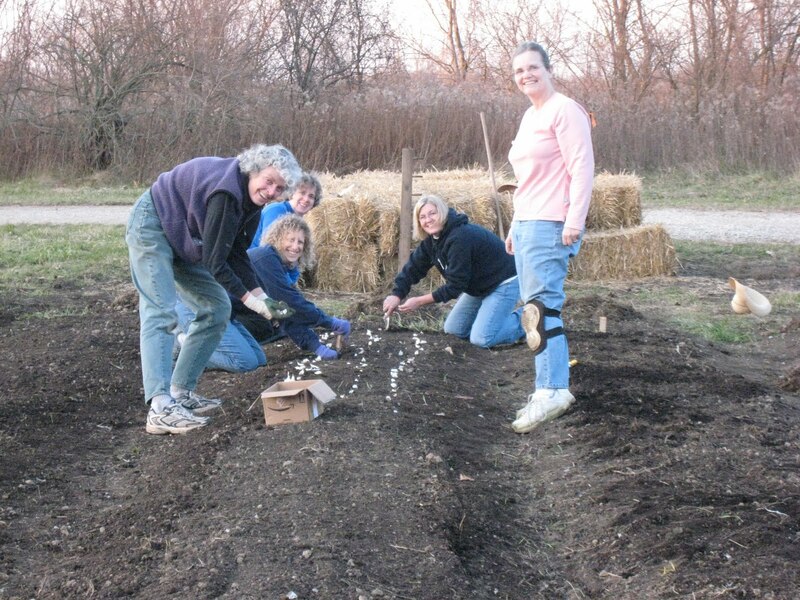 Friends came and went throughout the day, helping with various tasks such as separating the cloves, counting the cloves within each variety, raking the raised beds to level them and also remove any obvious clumps of grass still trying to grow, marking the holes for the individual cloves, planting the individual cloves, marking the end of rows with stakes labeled by variety, chatting, eating, enjoying the sun and warmth, and also helping to move a huge brush pile to a more appropriate burn site for a future bonfire (we're thinking about the night of the winter solstice - Dec 21). My husband is providing our helpers with some local currency that he is calling "Garlic Guilders" to be turned in next year for garlic crops when they come in. One of my sister-in-laws is excited about figuring out how to actually make paper from all the garlic bulb wrappers (i.e., the papery substance that surrounds a whole garlic bulb). We now have bags of this, which we could compost, but are hoping to do something much more creative with it all. I forgot to take any pictures of our potluck at the end of the day, but suffice it say, we had great food and plenty of it. I cannot wait until we do this again next year. Many hands truly make light and enjoyable work. It was a day of joy and nearly all the garlic is planted. The only cloves we had left to plant were: (1) a few varieties that are "auditioning", meaning we only had 1-2 cloves of brand new varieties to plant to see how they will grow in our soil and climate, and (2) the very smallest cloves which will be used for green garlic, the first harvested garlic crop of the year, usually only available at farmers' markets (unless you know us or grow your own!). I'm going to end with a few photos of sunset on our farm. True disclosure, these photos were taken on a different day than the "garlic planting fiesta" but even though the photos from my camera don't do the evening justice, this evening was breath-takingly beautiful. I can't wait until we actually move out here! We're on our way, shaping the future, one clove at a time. :-) Come buy from us at our local Farmers' Markets next year (Ann Arbor, Ypsilanti, and hopefully, even a new Farmers' Market in our own new hometown of Dixboro, MI, just east of Ann Arbor) or come help us harvest or plant in 2010! I'll bring you up to date about our garlic planting fiesta in my next post, but first I wanted to finally share a bit about my travels earlier in November. I made a whirlwind trip with the initial stop being in Washington, DC, where I was invited to speak about my personal experiences as a cancer survivor at the annual research meeting for The American Institute for Cancer Research (AICR), the organization where I donate proceeds from my book (A Dietitian's Cancer Story) in order to help fund research projects focused on nutritional strategies for cancer survivors. It's an international meeting that brings together researchers, oncologists, and other oncology team members (such as Registered Dietitians) who are all passionately interested in promoting the optimal nutritional strategies for prevention, treatment, and recovery from cancer. It was an honor to have the opportunity to wrap-up the talks about cancer survivorship and lead into the panel discussion on this important area of concern for the millions and millions of cancer survivors in this country. From there, I flew on to Boston for an annual appointment with a cardiologist who sees many patients like me, i.e., survivors of childhood cancers who have developed cardiac problems in adulthood from the cancer therapy used for their childhood cancer. My problems are what my husband likes to call "problems of success" :-), meaning that the therapy used at that time did lead to long-term success (hey-I'm still here and enjoying life!) even though I'm dealing with some additional health concerns. My reason for telling you all this is as backdrop for the real point of this post. 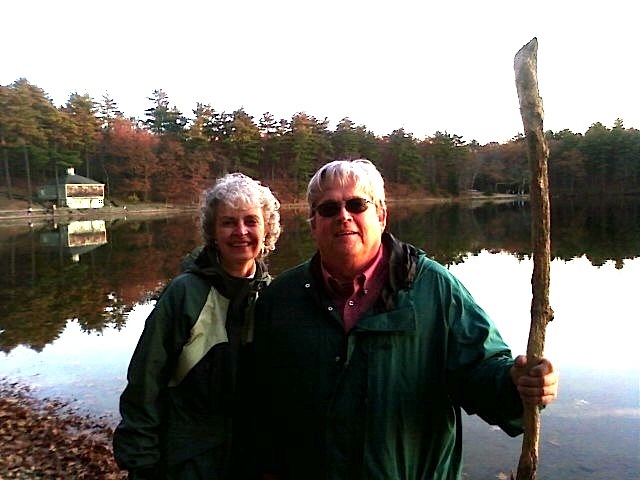 While in Boston, we stayed with some good friends from Ann Arbor (now living near Boston) who took us to visit Walden Pond where the well-known writer Henry David Thoreau, an American author, poet, and philosopher who lived from 1817 to 1862, conducted his experiment in "living well". Henry David Thoreau's work and writings are extensive and cover many topics. After finally having the opportunity to visit his home site at Walden Pond and to feel his enduring presence there, I am inspired to share a few of his words that have been inspirational to us for many many years. Indeed, as we express our deep gratitude for this opportunity for "living well", to bring love, life, and beauty back to our farm land and house, I could feel Thoreau's spirit at Walden Pond reassuring us that we are doing the right thing at the right time (finally!) for the right reasons. I am ending with perhaps my favorite quote of all, a quote by Henry David Thoreau about the bird called a wood thrush, which is the bird we heard singing from our woods as we stepped out of our car after closing on our new home. For those who do not know the song of the wood thrush, I have also included links to several sites where you can listen to its mesmerizing song. Although the song sounds nothing like a bagpipe, the effect on me is the same. Both sounds cause me to stop what I am doing, listen with my whole being, feel goosebumps and a few tears, and then all in an instant, feel myself being transported back to someplace very ancient, someplace very beautiful, someplace I been before. Here are some links to the song of a wood thrush. I hope you hear one next spring!